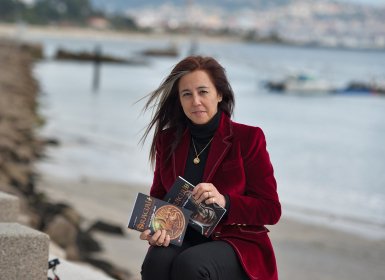 An experienced journalist, Elena Gallego Abad is the author of a series of novels about Dragal, the Galician dragon seeking to reincarnate in the body of a boy, Hadrián. The saga comprises three novels – Dragal I: The Dragon’s Inheritance (2010); Dragal II: The Dragon’s Metamorphosis (2011); Dragal III: The Dragon’s Fraternity (2012) – and further novels are planned. A film, together with other multimedia content, is currently in production. Elena Gallego Abad is the author of another novel, Seven Skulls (2014), which follows a journalist, Marta Vilas, as she investigates a case of multiple murder. The author is often described as the Galician J. K. Rowling and praised for being the first woman to write a crime novel in Galician. The dragon’s shadow was everywhere, even though Hadrián was the only one who could sense its presence. The power of Dragal would soon become manifest, but, for those who were not aware of it, it was just another day like any other. All the pupils in the class were anxiously awaiting the arrival of Miss Ermidas with the marks from the maths exam. They knew, as always, she would enter the classroom two minutes after the bell rang. Not a second before or afterwards. The old teacher arrived on time, clutching her folder to her chest. She slowly draped her red cardigan over the back of her chair and, having greeted the children in the room, began to pass the exam papers around the desks. ‘Antón… no comment. We’ll see each other in September, and possibly next year as well. ‘Teresa… you could do a lot better. ‘Breixo… you have to use your head for something other than wearing a cap. ‘Antía… carry on like this. 8 out of 10. ‘Marta… on this occasion I was expecting a lot more than a mere pass. As the teacher continued walking past the desks, getting closer and closer to the back of the classroom, Hadrián stared out of the window. The rain beat against the windowpanes, but the boy was looking further away, at the façade of the old church of St Peter’s. He found it where it always was, on the cornice, and smiled when old Dragal winked in a gesture of complicity.